The National Aeronautics and Space Administration’s rather dull designation of its first space worthy shuttle was OV-102 (for Orbiter Vehicle). But to the wider world it would always be Columbia, pioneer of an entirely new sort of space flight from the USA. NASA launched Columbia for the first time in 1981 and it would go on to fly 27 successful missions. Tragically, the 28th proved to be its last. After spending 300 days in space, completing over 4,800 orbits of the earth and flying around 200 million kilometers (125 million miles) in a long and honorable career, Columbia would self-destruct. 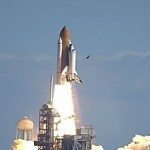 The cause seemed innocent enough – a piece of insulating foam that detached from the external fuel tank during launch and hit the left wing – but the consequences of this near-routine happening proved disastrous for NASA’s unlucky 113th shuttle mission. Engineers suspected damage to Columbia’s thermal tile cladding, but NASA vetoed a space walk to check on the basis that nothing could be done anyway. It is debatable whether a close- inspection of the damage would have allowed the astronauts or NASA to somehow save the day, but at least it might have given the doomed crew a chance. As it was, re-entry proved to be catastrophic. The holed wing was incapable of withstanding intense temperature as superheated gases entered and destroyed the wing structure, causing the rest of the shuttle to break apart. Horrified observers on the ground saw a fiery smoke trail high in the sky, even as mission control realized that Columbia had been tragically lost. The second fatal destruction of a shuttle effectively ended the orbiter program. Though a number of further flights were planned and executed, NASA decided that the way forward would be Orion, developed from the successful multiple-stage Apollo spacecraft of an earlier era. You should know: There was already a peak in Colorado’s Sangre de Cristo Mountains – Challenger Point – named in memory of the previous lost shuttle. It would soon be joined by its immediate neighbor, which became Columbia Point to commemorate the second disaster. The crew were also honored by the naming of the Columbia Hills on Mars, which may one day be visited by their successors in space.